The well-named Cat’s Paw Nebula (also known as NGC 6334) lies in the constellation of Scorpius (The Scorpion). Although it appears close to the centre of the Milky Way on the sky, it is relatively near to Earth, at a distance of about 5500 light-years. It is about 50 light-years across and is one of the most active star formation regions in our galaxy, containing massive, young brilliant blue stars, which have formed in the last few million years. It is host to possibly tens of thousands of stars in total, some of them visible and others still hidden in the clouds of gas and dust. In this space wallpaper, the well-named Cat’s Paw Nebula lies in the constellation of Scorpius. Although it appears close to the centre of the Milky Way on the sky, it is relatively near to Earth, at a distance of about 5500 light-years. It is about 50 light-years across and is one of the most active star formation regions in our galaxy, containing massive, young brilliant blue stars, which have formed in the last few million years. 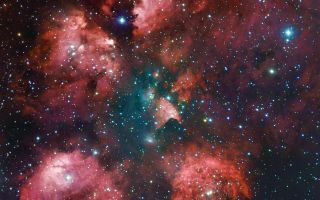 It is host to possibly tens of thousands of stars in total, some of them visible and others still hidden in the clouds of gas and dust.